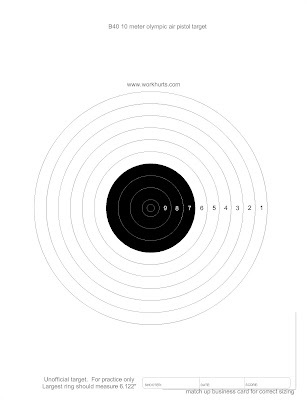 I drew all of these targets in AutoCAD from the official NRA handbooks to the specified sizes. The NRA has not certified me as a legal printer of targets, so you can't use these for official competition with NRA ranking. I drew these with the idea of practicing and postal matches in mind. New to the idea of postal matches? Get together a group of people, everyone prints the same target and agrees on rules as far as distance, number of shots, scoring etc. Shoot your course of fire scan or take digital pictures and post results. A fun way to compete on your schedule and location. When you print these, I have two ways of confirming size. If you have a calipers, measure the outermost ring and compare to the specified size. Adjust scaling up or down to fit. If you don't have calipers, place a business card in the lower right corner and compare to the line there. Have fun and don't put and eye out. Is this no longer free?